Stitches: ch, sl st, sc, sc2tog, rev sc. Holding two strands of each color (total of six strands) together throughout the pattern. 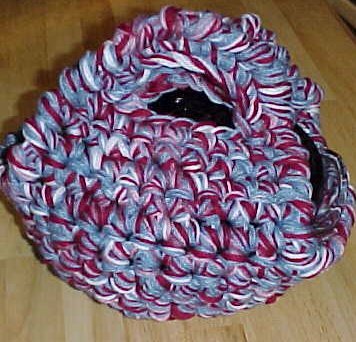 R1: Ch1, make a loop with your yarn tail to crochet around. Work 12 sc in the loop. Once the 12 scs have been made, join with a sl st in the first sc. Now pull the yarn tails to tighten the center of the round. R2: Ch1, turn. 2sc in the first st. Sc in the next st.
R3: Ch1, do not turn. Sc in first st, ch1. (Sc in next st. Ch1) around. R7: Ch1, do not turn. Sc in ea st. Place Marker. R8: Do not turn. Sc in ea sc. Join with sl st. Do not fasten off. R1. Ch1, turn. Sc in 10 sts. Rs2-6: Ch1, turn. Sc in 10 sts. R7: Ch1, turn. Sc2tog. Ch6, sk 6 sts. Sc2tog. R8: Ch1, turn. Sc in first st. Sc in ea ch. Sc in last st.
Reattach yarn in the first of 10 sts on the opposite side. Ch1, Sc in 10 sts. Rep Rs2-8 for first handle. EDGE: Ch1, do not turn. Rev sc around entire edge. Join with a sl st.